Thermal transfer printers use ribbons, coated on one side with a wax, resin, or combination of the two. 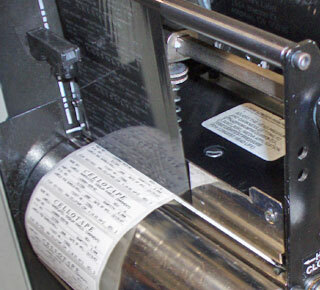 The ribbons are fed between “thermal print heads,” described below, and a substrate to be imaged. Thermal print heads are comprised of a linear array of tiny resistive heating elements (100-300 per inch) that are arranged perpendicular to the paper flow. Each print head element locally heats an area below it. This heat melts the wax or resin coated onto the ribbon below, transferring the image to the substrate underneath. The small size of these elements gives us the ability to print the very fine detail required for bar codes.